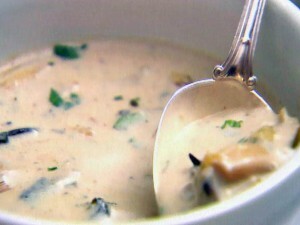 Ceamy Mushroom Soup recipe by Nazia Nazar at PakiRecipes.com. Add the flour and saute till there is no raw flavour coming from flour, taking care that the flour does not get burnt. The soup should have a smooth texture. Bring it to a boil, correct the consistency by adding more milk if required. Add the cream (reserving a little for garnish), salt , pepper powder and nutmeg powder. Stir well, serve hot, garnished with mushroom slices and cream.